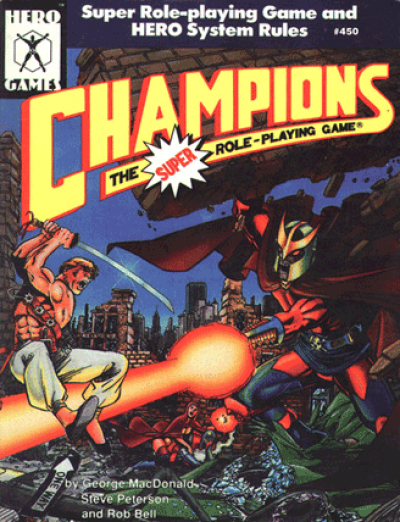 Hero Games’ Champions wasn’t the first superhero roleplaying game1 or even the first SHRPG I played2. It was, however, the SHRPG I played the most often. Originally published in 1981, the system was initially developed in a rather haphazard way; rules accreted across several editions of rule books. Efforts to correct this lack of organization began in the mid-1980s. 1989’s 4th Edition Champions, written by George MacDonald, Steve Peterson, and Rob Bell was arguable the culmination of this process. Known as the Big Blue Book, it was a fan favorite that shaped many games that came after it. How does the rulebook stand up after OH GOD HOW IT IS 30 YEARS ALREADY? Well, for one thing, the binding on this beautiful hardcover was kind of crap. Every copy I have owned had a cracked or broken spine. At least it had an eye-catching George Perez cover, an indication that this was intended as an elite edition. But as to game mechanics: it’s an early 1980s game (reflected in the fact the text acknowledges it uses only “he” or “him” because in their view inclusive word choice would be too cumbersome.). At that time (in the long gone and distant past) complexity was seen as positive. The designers were also comfortable expecting players to do math. Nothing complicated, but it was best to have a calculator handy. In the hands of someone familiar with the system, play could be flexible. Flexible enough that one could design characters that broke the game. One could design a side-arm that would punch holes through planets. One could spend points on a headquarters that could own the universe. One could craft attacks that could destroy the universe. It was up to game masters to say “no” when appropriate. The system was originally designed3 to handle people ranging in power from your squishy Uncle Bens4 to your Supermen. As a consequence, the system was extremely granular at the lower end. As well, because of the way round-offs worked, certain ability values were much more cost effective than others. The result was that characters’ abilities tended to cluster around certain very specific values. Again due to the range of characters the system had to handle, combat, while delightfully colourful5, could be … very deliberately paced, with hours of frantic dice rolling to simulate a minute or so of combat. Still, compared to first edition Dragonquest, it was pretty fast6. Because the system was so…. I am going to go with “detailed”, learning all of the ins and outs of the system could be a bit challenging. Still, it was easier to learn than Chivalry and Sorcery6. It operated at the upper end of playable complexity7. With no more effort than is required for a PhD in quantum mechanics or to master the whole of the Torah in an unfamiliar language, one was handed an incredibly flexible system that managed to simulate the world of superhero comics with a fair amount of success8. As a result, although the system has been eclipsed to a fair degree in the OH GOD HOW IS IT 30 YEARS since this edition came out, it’s still an incredibly influential system. Many (and I am tempted to say virtually all) subsequent systems were shaped by it, either emulating design decisions in more user-friendly ways or attempting to reject its excesses. While not the first SHRPG, Champions was in many ways the genre-defining game. Champions, 4th Edition is available here (DriveThru RPG). 1: That was Superhero 2044. I have never seen a copy. 2: Either V&V or Superworld, both of which I only played once. 3: Hero transformed their mechanics into a generic rules system which they used for a variety of genres. How successful this was depends on the player, although I was never particularly happy with their fantasy rules set. Because the essential rules were scaled for nigh-gods, normals tended to be very limited in their abilities. 4: I was going to say Jimmy Olsen, but Jimmy survived many near-death experiences; he was probably a higher point character than he appeared to be when he stood next to Superman. See also the prose character Travis McGee, who, when built under Champions rules, costs more points than Batman. 5: I was particularly fond of the knock-back rules, which dictated how hard people flew after being punched. In real life, the only times I got hit and went an appreciable distance involved a car and a bull. Not at the same time. Those were two different events. 6: Trust me, this is hilarious. 7: I know this because later editions devolved into unplayable complexity. 8: Speedsters like the Flash being the main exception. I don’t know how many points it would take to build Barry Allen, but it would be lots. Lots and lots. I did more V&V with a GM who decided that he didn't want to come up with scenarios, so he created two teams: The Heroes and the Villains. It worked wonderfully, I was on the Villain team and we caused a ton of trouble for the good guys. When I bemoaned that my favorite V&V character couldn't be made for less than 300+ points, the Mushroom people would point out how to min/max the values with various limitations and disads that it made him into an entirely different person with powers that worked differently. And they never understood that the character concept was more important to me than making a wonky clone in Champions. So I never played a game of it. Those bindings were terrible. I like 5th edition better but probably played 4th more. I probably should have mentioned the best part of champions, which was rolling all the d6s within reach, then summing their values while also tracking ones and sixes. Using one dice roll to generate two kinds of damage was innovative. ...How much scratch paper did one go through in a combat because of this innovation? Surprisingly little: Most of the totaling is done by looking for 10s, (e.g. "6 2 2" or "5 4 1" while you read the body¹ result by pairing ones and sixes, (it was #dice + #sixes- #ones). After you get a little practice you can quickly do both in your head. 1: Since the typical damage roll had the dice total as the amount of damage done to your STUN, (that knocks you out), and the one/sixes result the damage to your BODY, (which killed you²), the terms quickly developed to talking about the stun and the body results. 2: Yes, it was quite possible to kill someone without knocking them out. The bad binding led to its nickname, "Champions Unbound"
I think my first was Champions 2nd or 3rd edition; the next ones I actually played were Golden Heroes which was a bit of a kludge but played a lot faster, and the Judge Dredd RPG which was a lot more limited in scope and had horrible rules, because I was writing for Games Workshop and they wanted me to write for the systems. The other one I've used a fair bit was GURPS Supers. I quite liked fourth edition - it was easier than combining all the supplements from earlier editions together. It was still mostly a superhero game rather than a universal game, which made a bit more focused and playable than later versions of Hero; the stun/body mechanics for damage were also pretty neat, not only mechanically but also as a way to elegantly keep characters from being killed too often (instead knocking them out). I remember running a short Legion of Superheroes-style campaign with it that worked pretty well, and was also able to do a decent job converting characters from my homebrew science-fantasy setting (sort of a hybrid Zelazny/Cherryh/Aldiss universe) to it. My main problemwith Hero was that the Star Fleet Battles-style Speed segment system, while it worked, seemed overly complex; I never quite warmed to it; also, as mentioned by others, the character generation system required careful balance and the GM always had to be on top of what the players were building to avoid mis-matches either way. Skilled players who knew their way around multipowers, limited uses, gadgets and other system tricks could also readily create characters that easily outshone those of novice players, which could also be a problem. I found this stressful as a GM, far more so than running, say, Traveller or something, though Hero did have its own rewards. I think it is largely unequaled as a triumph in terms of game mechanic design - there are few games that complex that worked so well even in the earliest editions. In a supers campaign one can keep the workload down because in a pinch the only thing you absolutely NEED for a fast adventure is a wanted villain to show up in a public street; given that Hero combat could take most of the session, you are then good to go! But when doing more complex adventures the detail level of the system tended to make it a bit less playable.